What is self-discipline? How do you build it? And how do you get motivated to take that first step? All the answers are right here. Self-discipline. Let’s be honest. For most of us, it’s a work in progress wrapped in good intentions, procrastination, and feelings of failure. But it doesn’t have to be. Self-discipline, like everything else, is a practice. Not every day will be perfect, but each day — with its failures and small wins — is progress, and that’s what self-discipline is all about. I’ve rounded up steps you can take today to build self-discipline. Coupled with a healthy understanding of what self-discipline is and a little inspiration, this post gives you the tools you need to develop a practice of self-discipline in everything you do. “Willpower is what separates us from the animals. It’s the capacity to restrain our impulses, resist temptation – do what’s right and good for us in the long run, not what we want to do right now. It’s central, in fact, to civilization.” -Dr. Roy Baumeister, Ph.D.
Self-discipline is the ability to do what you should be doing. Self-discipline often means putting off your immediate comfort or wishes in favor of longterm success. For example, if you want to become physically fit, you might endure the short-term discomfort of 5:00 a.m. gym times to attain the longterm benefits of being healthy and feeling great. In “The Chimp Paradox,” Dr. Steve Peters explains we’re already the people we wish to be. Our emotional mind simply stops us from behaving how we need to achieve our ideal state. Self-discipline gives us the ability to overcome our emotional mind by moving forward with physical action. Achieve longterm goals – Self-discipline allows people to resist immediate wants in support of higher-impact, longterm goals. Grit guru Angela Duckworth speaks to this in her 2016 research on perseverance and “passion for longterm goals,” also known as grit. Her study found “the achievement of difficult goals entails not only talent but also a sustained and focused application of talent over time,” or what we would call self-discipline. Decrease anxiety – When we’re stressed, we each have our vices (Hi, my name is Meg and I procrastinate when stressed). When we experience negative emotions, humans tend to distract themselves by doing or thinking about something else. In fact, a 2016 study found improving self-control may help students deal with anxiety-related problems during school testing. Increase physical health – This is likely pretty obvious, but people who demonstrate regular self-discipline are better able to resist the use of health-damaging substances like tobacco and alcohol. Self-control is also linked to lower rates of obesity and addiction. Positively impact relationships – Yep, self-discipline can also make your relationships better. Psychology Today says, “The capacity for self-control is a capacity for empathetic perspective taking — the ability to step outside one’s own point of view.” Taking these steps allows us to override our automatic defensive reactions and adopt more constructive behaviors contributing to healthier, happier relationships. Feel happier – The more productive you are, the more creative and happy you are. The more we feel in control of the origin of our behavior, the better sense of well-being we have — and that makes us happy! Start by writing down what you do in a day. Then, reflect on what you value and ask yourself whether your behaviors uphold those values. There are likely a few things you’re doing each day that don’t honor those values (hey, we’re only human — we’ve all got a few). During the identification phase, it’s helpful to ask for feedback from the colleagues, mentors, and family who know us best. See if there’s overlap between how others see your actions and how you’ve self-identified your weaknesses. Greeting your coworkers and asking about their evenings. A trip to the kitchen for coffee. Team lunch. An afternoon walk to the local coffee shop. All of these small trips add up to a lot of time away from work. It’s important to build relationships with coworkers and give yourself mental and physical breaks throughout the day. But it’s also important to be honest about your work patterns. If your mornings are consumed by non-work-related events and that’s when you’re most productive — that’s not good. Know when you do your best work and schedule around it. If you’re most dialed in from 9:00 a.m. to 12:00 p.m., schedule those coworker coffee breaks for the afternoon. Protect your ability to succeed at work. You’ll promote a healthier environment for yourself and healthier results for your company. 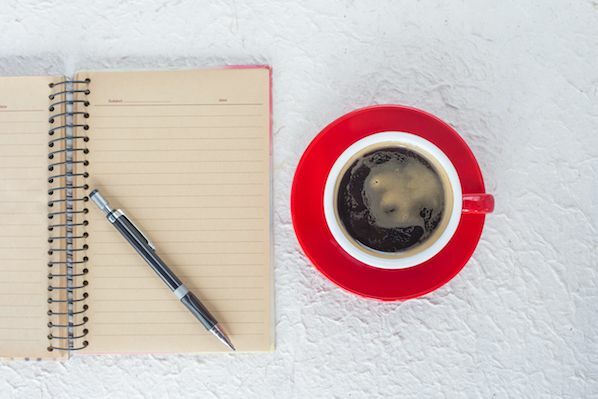 Did you know you’re 42% more likely to achieve your goals if you write them down? The act of writing down goals forces you to visualize the goal itself, how to achieve it, and what steps you need to take to get there. So, before you set out to become the best version of yourself — whether at work or in your personal life — identify your goals and write them down. Your brain doesn’t differentiate between real and imagined memories. So, when you imagine something vividly, your brain chemistry changes as if you’d actually experienced it. Visualizing positive outcomes like, “When I make it to the top of our activity board, I’m going to treat myself to an excellent dinner,” gives you the positive feelings associated with ascending to the head of the leaderboard while reducing feelings of insecurity. This makes it easier for you to overcome feelings of fear and take actionable steps toward achieving your goals. If you wait for your schedule to be perfect, your desk to be clutter-free, or your inbox to reach a manageable level, you might never get started on the work that needs to be done. Embrace every moment as having just what you need to do your best work — because, well, it does. Inspired by this list? Ready to wreck your bad habits and transform yourself into the ideal salesperson or employee? Start small. Overhauling your work habits in one week is a recipe for burnout and disaster. Instead, pick a few small habits to focus on each week. For week one, you might decide to bring your coffee to the office to avoid the morning rabbit hole known as “the break room” in favor of getting right to work. With a week of success under your belt, you might block a few hours on your calendar every Friday afternoon to finish up administrative tasks like adding prospect notes to the CRM or replying to outstanding emails. After a few weeks of improving one habit at a time — you might surprise yourself with how much more productive and self-disciplined you’ve become. There are things you can discuss with a mentor you might not be comfortable approaching with a colleague or manager. If I want to stop wasting so much time on social media when I’m supposed to be prospecting, I might feel better bringing that challenge to my mentor rather than my boss. Mentors generally have more experience, know you well, and can give you the unvarnished advice and feedback you need to succeed — not only in your current job but in your career. It’s not that those with self-discipline never have days where they eat all the doughnuts in the kitchen, spend 45 minutes on social media, and lose two prospects — all before 10:00 a.m.. It’s that they do these things, then they wake up the next morning and try to make better decisions. Self-discipline is the act of trying, failing, and trying again. If you don’t know how you’ll track progress, it will be difficult to know whether you’re succeeding. If your goal is to book more meetings during the first half of the month, start by identifying how many meetings you want to book. Then, work backward to figure out how many meetings you’ll need each week and how long each one will take to finalize. Once you’ve determined the details of your goal, decide what success looks like. Are you simply shooting for the overall number? Will it count if a meeting cancels at the last minute? Should the meeting lead to a demo? Determine what success looks like, so you know how to measure it. Self-discipline is worth very little if you’re killing yourself to achieve it. Everyone works the occasional 28-hour day (those exist, right? ), but if you’re burning the midnight oil for weeks or months on end to be more “self-disciplined,” you’ve missed the point. Part of self-discipline is taking care of yourself. Breaks throughout the day, a healthy diet, plenty of sleep, and healthy relationships make the world — and us — go ‘round. In fact, studies show mindfulness exercises like taking a short walk, noticing five things around you, or identifying two smells can actually increase productivity in the workplace. Want your good habits to stick? Studies show rewarding yourself is key. Deprivation means we start justifying bad behaviors. This often sounds like, “I’ve earned this,” or “I deserve this,” — and it’s often the beginning of the end of our progress. Instead, give yourself treats throughout your self-discipline practice. These treats — whether a nice dinner or a new pair of shoes — will help you feel energized, restored, and never deprived. If you wake up late, rush to the office, and forget to bring your coffee which thrusts you into the break room rabbit hole for 30-minutes of coworker conversation and three prospect calls short of your daily goal, look at the situation realistically. Did you fail to meet your goal? Yep. Will you have to make a few more calls tomorrow? Probably. Will this have any effect on your longterm progress? Nope. Once you’ve looked at the impact of your slip, you can decide how to move forward and get back on track. Step one? Make sure your alarm is set before going to bed. Remember, self-discipline is a practice. You will not be perfect every day. What’s important is showing up each day ready to try. So, what changes are you going to make today? Failure — A Wake up Call to Life. Self-Discipline: Enemy of a Good Time or Key to Achieving Your Goals?